When things get hairy, nerves are frayed and frustrations are running high, your calming influence as an occupational therapist (OT) can be the beacon in a storm of emotions. Loud noises, bright lights, changes in schedule and overall tiredness are just a few good reasons to take a sensory break. Knowing some good sensory strategies will help you restore comfort, calm and security throughout the day. Create a special space where children can sit or lay quietly until they are ready to rejoin the group. Set up an inviting nook in the room with pillows, chairs, mats, or a small cot. You can also include a few tactile toys, books or stuffed animals. Play tents or homemade canopies will make the Quiet Corner even more private — shutting out unwanted stimuli for all who visit. Invite students to try out the space before they really need it so they are first familiar with it. Remember to provide a way for children to indicate when they’d like to go to the Quiet Corner. Occupational therapists can do this with sign-up sheets or small, laminated cue cards. Tactile sensory bins are easy to make and effective in school-based occupational therapy. OTs can fill the bins with squishable play dough, or dry beans that feel great slipping through the fingers before pitter-pattering back into the container. The sky really is the limit with tactile bins: all you need are large plastic storage bins and your choice of fillers. Think sand, feathers, beads, rice, etc. When children feel overwhelmed, the soothing pressure of a hug can help. Wrapping their arms around their own bodies or squeezing a stuffed animal is one strategy that may bring about calm. Some children may benefit from the gentle pressure of a weighted doll, stuffy or tightly-wrapped blanket. Sinking into a comfy beanbag chair can also elicit feelings similar to receiving a hug. Great for when kids need a break and also when they’re on top of their games, calming music never goes out of style. There are so many options—from white noise, nature sounds, gentle, classical tunes. Try playing music when children are working independently or winding down from active play. When applicable, music works at rest or naptime, as well. Occupational therapists may even consider adding noise reduction headphones or regular headphones to your Quiet Corner. Gentle, repetitive and rhythmic movements like rocking, swaying, or gentle swinging can be extremely calming. These types of activities can be the perfect remedy for children in occupational therapy who need to reset when they are over stimulated or overwhelmed. Simply adding a rocking chair or two to your occupational therapy classroom can work wonders. Exercise balls for bouncing are also helpful in when providing occupational therapy in schools. Technically known as proprioceptive movement, certain types of “heavy work” activities do wonders for restoring calm and order by stimulating the muscles and joints. Ask students to “help” hold a heavy door or move desks and chairs. Carrying books is also a great proprioceptive activity, as are squeezing/squishing play dough, climbing and pushing/pulling against resistance bands. Often called calm-down bottles or sensory bottles, these beautiful and mesmerizing tools aid in self-regulation when dealing with tough emotions. They are easy to make, and could serve as a great group project to build fine motor skills. An empty bottle or jar, glitter, clear glue or oil and hot water are all you need. Optional items that can be added to calm-down bottles include pompoms, beads, small stars or objects, paint, food coloring and even Rainbow Loom bands! Don’t forget to hot glue the lid onto the bottles once completed. Whichever calm-down methods you choose to offer in your occupational therapy setting, your guidance will be an important factor in ensuring success. Helping students make the transition from dependent regulation to self-regulation requires patience, calm and consistency. It is a life skill that they will rely on through childhood and into adulthood. Your caring assistance in their individual journeys will certainly be remembered. 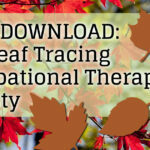 What has worked for you, your pediatric occupational therapy colleagues, and your students? Please let us know in the comments below! I really appreciate the insight here in this post and confident it’s going to be helpful to me and many others. Thanks for your informative post!